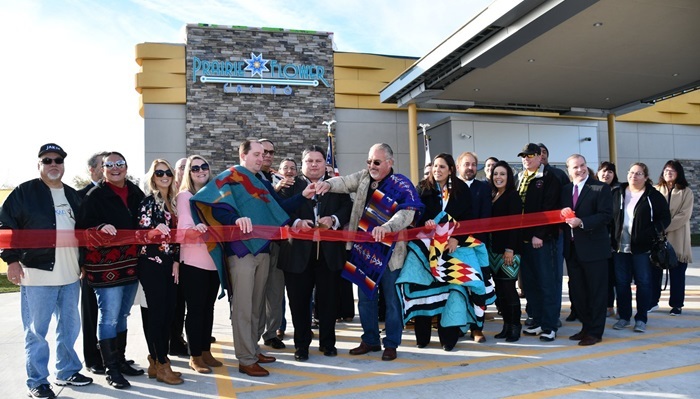 In Iowa, the Ponca Tribe of Nebraska celebrated the opening of the new Prairie Flower Casino on Thursday in the small town of Carter Lake, marking a milestone for the federally recognized tribe which claims a membership of more than 4,200 members. Commenting on the opening of the casino, which provides the tribe with an important new revenue source, tribal chairman Larry Wright Jr., said, “I’m excited, overwhelmed. This a great day for our people,” said Larry Wright Jr., the tribal chairman. “We have been able to grow, with eyes to the future. This is a symbol of our resilience,” according to the Omaha World-Herald. 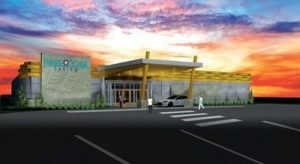 In June this year, the Nebraska tribe broke ground on the 9,500 square foot casino, which is located on five acres of tribal land at 1031 Ave H. where a Ponca cigarette shop had reportedly been operating on the site. The gaming venue features 200 Vegas-style slots along with a full-service bar and a snack bar and will be open 24 hours a day. The casino employs 100 people and represents phase one of the Prairie Flower project. While for now there are no gaming tables, plans to expand the venue’s footprint to include up to 2,000 gaming machines and 50 live table games are in-progress and will be released to the public when finalized, according to the tribe’s August press release (pdf). 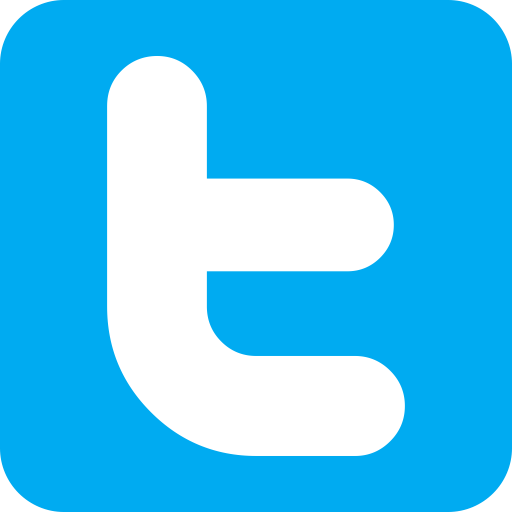 The gaming facility is located in the small town of Carter Lake, which sits geographically on the Iowa side/west side of the Missouri River, adjacent to Omaha, where casinos are illegal. The hope is that the casino will draw a large number of its future players from what is the state’s largest city and just three miles from Carter Lake. The opening comes after a decade of lawsuits, appeals and legal reviews, including a series of rulings from the National Indian Gaming Commission (NIGC), which in November last year, gave the tribe the green light for the casino. It is anticipated that Prairie Flower Casino will face stiff competition from the three much larger casinos located across the Missouri River in Council Bluffs, which include the Horseshoe Council Bluffs, which offers more than 1,400 machines and 64 tables; Harrah’s Council Bluffs, with 543 machines and 22 tables; and Ameristar Council Bluffs, which features nearly 1,600 machines and 26 tables. In 2017, the three casinos located in Iowa’s Pottawattamie County took in $174 million, $73.7 million and $172 million respectively. Along with the approximately 150 people who attended the ribbon-cutting ceremony on Thursday, the leader of Shakopee Mdewakanton Sioux Community (SMSC) from Minnesota, Charlie Vig, was also in attendance. The Minnesota tribe, which has reportedly achieved financial wealth thanks to its Mystic Lake Casino Hotel, Little Six Casino and related enterprises, underwrote the Prairie Flower project. The Ponca Tribe were reportedly given a $1 million grant by the SMSC in 1999 to purchase the Carter Lake property, along with a $10 million loan for the construction of the new casino and other projects, according to the Omaha newspaper. While the tribe has tax-exempt status, it has reportedly agreed to an annual donation of $775,000, which will go to the city of Carter Lake for the police department, emergency services, and other services. According to the news agency, profits from the casino will fund those programs, as well as youth programs and elder care, and towards the preservation of the Ponca language. As for the planned future phases of development, they will likely be put on hold for a considerable amount of time as a federal lawsuit filed late last year by the City of Council Bluffs names as defendants the U.S. Department of the Interior, which administers the Bureau of Indian Affairs (BIA), and the NIGC. 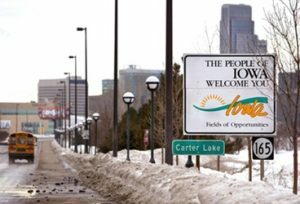 The States of Iowa and Nebraska and the City of Council Bluffs have tried for 10 years to block construction of the Ponca’s casino. Due to its location, the Prairie Flower Casino is seen as a threat to cut into tax revenues generated by commercial (non-Indian) gambling enterprises that currently operate in the state. Meanwhile, officials in Nebraska want to keep the slots and the tables away from the state where casino gambling is still illegal. The casino is named after former Chief Standing Bear’s daughter who died during the forced removal of the Ponca Tribe from their homeland in northeastern Nebraska to Indian Territory in Oklahoma, as announced in August this year.